BBC NEWS | UK | Magazine | What would you take from your desk? What would you take from your desk? If you were told to clear your desk of personal belongings and leave the building, like staff at the UK headquarters of Lehman Brothers, what would you take? Photos of the kids, spare ties, trainers, mugs - a cuddly toy? What was in the cardboard boxes being clutched by stunned staff as they left the London offices of the bankrupt US investment bank Lehman Brothers?. But if you got the same instructions from an employer, what would go into your box? "I'd take a piece of card with my name written in Arabic on it, a 30-year-old photo of my school football team, a Barcelona football club mug, a copy of my friend's novel, a two-year-old thank you card from a student, some spare contact lenses, an iPod charger and two pairs of shoes," says teacher Chris Baxter. "Mainly they're little things, but most of them are very personal. A lot of the time I don't really focus on them, but other times they trigger good memories. I wouldn't want to leave them behind." For some it's a case of accumulation by stealth, rather than a conscious decision to personalise a drab little corner of corporate space. "Generally, I have a problem with what I call the 'trinketisation' of one's workstation, so I don't have things like pictures or figurines to take away with me," says fellow teacher Sian Allen. "But I would take my draw full of shoes for various social occasions after work, including one pair of Manolos. "Also a broken iPod, six Tupperware pots in various sizes, a M&S bra with broken under wiring, a selection of unread classics, half-used packets of Ibuprofen and a small selection of thank you cards with obsequious messages from students, to remind me that I am loved and appreciated." 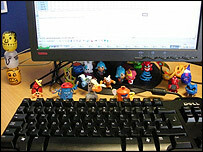 When people personalise their desk they are marking their territory, says workplace behavioural expert Judi James. "It's something humans are hardwired to do. We're basically animals and need to mark out what is our space. We're also nesting and making ourselves comfortable." But it's also about opening ourselves up to others and that can be very good for business. "Personalising your work space is also about giving other people the opportunity to ask questions, it's about socialising," says workplace psychologist Gary Fitzgibbon. "If someone sees a photo on your desk, or picture, it is easier for them to strike up a conversation and for communication to flow. Generally, if someone shows an interest in you, then you are more likely to help them when they ask." But the evolution of the modern office environment, with its hot desking, can make stamping some personality on your workspace a bit harder. Modern technology has also had an impact. "There probably wasn't many family pictures in those boxes being carried out from Lehman Brothers because the screensaver has replaced them," says Ms James. "Nowadays, personal possessions at work quite often come down to a pair of trainers and tracksuit for the gym." 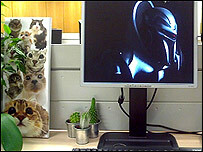 Here is a selection of items that you would take from your desks. I think I'd be content with my Alfa Romeo mouse mat and the rather dog-eared pictures of Joyce Grenfell and Margaret Rutherford that are currently adorning the casing of my monitor. If only Faust had heard of hot desking. On my desk I have: A jar of honey (for my morning porridge); the Statue of Liberty (obviously a copy - a souvenir of a trip to NY); hand cream; tea bags; a stapler (a battery-operated one I brought with me); my mug, bowl, plate, spoon, knife and fork; a container full of porridge oats; a packet of dried apricots; a packet of chopped nuts; several notebooks full of information; vitamin C tablets; and a packet of instant pasta - red wine and mushroom flavour! Also a few other bits and pieces scattered on the shelved behind me, including a coat, pair of shoes, items to do with my motorcycle club (newsletters etc.) and my hole punch. I have a longboard, rock from mountain, pic of my two-year-old old daughter, pic of Johnny Cash, rear view glasses. I have a picture of my dog to remind me of her, pencil with funny tops on them from places I've been around the world, a little cartoon character figurine (Chucky from The Rugrats) a stone that's supposed to be good luck.. bright coloured tabs on each side of my monitor with phone extensions just to brighten my desk area up. My drawers are filled with food for breakfast and lunch! What would I take? Everything that wasn't nailed down! 10 weeks ago on my redundancy I took: 1. All my personal bits & pieces. 2. As much of the stationary cupboard as I could pour into my large cardboard box. 3. Several DVD's of data & client info. 4. As many of the data wall-charts (£1200 each) as I could fold up and put in my cardboard box. 5. My company laptop that I just happened to have left at home the previous week. 5. Anything else that wasn't bolted down in my office. 6. Oh, and a smug smile on my face.